Sydney Golf Courses in the 1930s – What course is this? 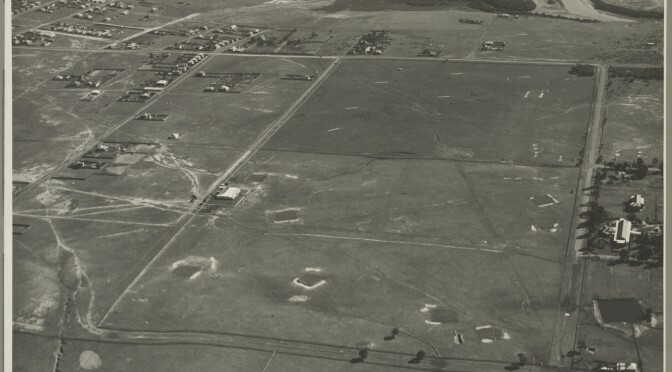 There is a wonderful series of aerial photos held in the collections of the State Library of NSW showing a number of golf courses in Sydney in the 1930’s. Some photos can be dated a little more accurately than others by the presence of certain buildings. The index to the photos is not totally accurate and AGHS would like to see this corrected when we are satisfied with the corrections. The featured photo of this post (shown above) is photo 11 in the index and is definitely not Concord as labelled. We’d appreciate your comments/conclusion on this. Please use the form below to let us know where you think – or know – the mystery golf course is – or was – situated. If you can convince a judging panel that your identification of the course is correct, a sleeve of Australian Golf Heritage Society mesh replica golf balls is all yours. The index page to the images can be accessed here (“Contents List” tab) and a larger view of the photo above can be found here. Comment: Great idea, luv the concept of finding “old” courses. I have two possibilities, either Herne Bay or Greenwood. Ross – Herne Bay was the original name for the Sydney suburb of Riverwood, and the Herne Bay course was in the vicinity of Salt Pan Creek. There is a very short history of the course – including a photograph – here. Herne Bay was taken over by the U.S. military in 1943 for use as a hospital. Greenwood was the third course built by Waverley motor mechanic Francis Crowe (the others being the old Liverpool course and the Riverwood layout at Georges Hall). Greenwood was on Walder Road at Hammondville, and the bottom of the course fronted the Georges River. It was subsumed by urban sprawl in the 1970s, although the New Brighton Club have made known their intention to build seven holes on parts of the old Greenwood site. The photograph is neither of these courses. Nice try though. Comment: Some of these pics were used in the circa 1938ish publication Golf Courses of NSW , strangely some of the pics in the publication are not in the collection held by the State Library of NSW. Not Concord again (click to enlarge). that is neither considered part of the collection nor properly catalogued, even though it is undoubtedly from the same series of photographs. The big question is whether the mystery course is included in your ‘Golf Courses of NSW’, and whether it is correctly identified. A sleeve of Australian Golf Heritage Society mesh replica golf balls is a stake here! Comment: OK, my third & last attempt is to nominate Kirkham Lane ! Ross – Strangely enough, we were talking about Kirkham Lane at the Museum today. The discussion centred around the ability of golfers – of various vintages – to recall course layouts from many years ago, and one of the participants recalled the hole at Kirkham Lane where he scored his first hole in one. No name, no pack drill. Kirkham Lane was in the general vicinity of the Nepean River and Narellan Creek at Camden, so the requisite water course box is ticked. However, the site of the course was, and still is, primarily rural in character. The housing development around and about our mystery course says one thing . . . not Kirkham Lane. You are – however – to be complimented on your knowledge of defunct Sydney golf courses. Recent research published by AGHS members: A Famous Rules Incident in 1907. A full copy of the article can be obtained by contacting the History Sub-Committee via the About menu. The article gathers primary source evidence to describe and discuss in depth a bitter controversy at the Australian Open. Research underway by AGHS members includes an in depth study of the Lakes Open. This tournament was run and financed by The Lakes Golf Club. It was played over four rounds from 1934 to 1974 and was one of the most important tournaments on the Australian golf calendar with a very large prize pool for its time. In 1951 the Australian Open at the Metropolitan Golf Club in Melbourne was won by Peter Thomson by four strokes over Norman von Nida. Question #1. How many Opens (British) did Peter Thomson win? Question #2. How many Opens (British) did Norman von Nida win? Answers soon on the website and the next issue of The Brassie.